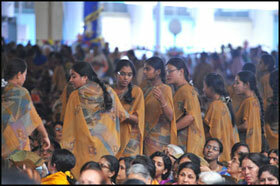 Shivarathri is a festival of great vigour and vitality at Prashanti Nilayam. Needless to say that this is because of the fact that Swami is considered as the Shiva-Shakti incarnate. The crowds had once again swelled in the first week of March and the Sai Kulwant Hall could in no way accommodate all the eager devotees. The spillover had been directed to the Poornachandra auditorium and a giant screen had been put up there for all to view the action going on in the Sai Kulwant Hall. 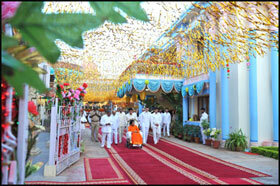 It was shortly after 6 p.m. that Swami gracefully came out of the Yajur Mandir. 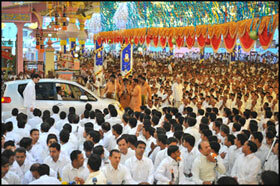 The past few days had been such that everyone was keeping their fingers crossed about Swami coming for darshan. 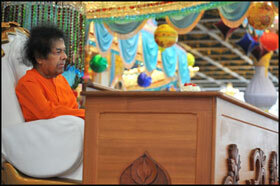 As always, Swami’s concern for our concerns is greater than what we can ourselves feel! He came out, in all beauty and solemnity! He moved first to the Poornachandra auditorium. His appearance on the stage there had a magical and mesmerizing impact! 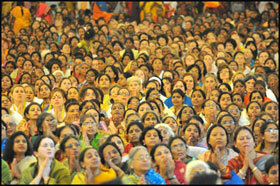 The devotees seemed to be ecstatic in love and devotion as they rose up with folded hands. A roar of joy and thrill moved through the entire auditorium as Swami came to the centre of the stage, between two majestic brass lions, and granted darshan. 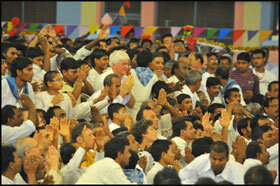 After a few minutes there, Swami blessed all the assembled people and moved out of the auditorium. Getting into the car, Swami moved into the Sai Kulwant Hall. 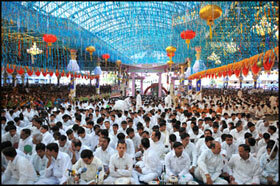 The Veda chanting was on from 4:30 p.m. and it continued even after His arrival into the hall. Taking a complete round in the hall, Swami arrived in the portico at about 6:25 p.m. A huge cake with Lord Shiva, Swami and Shirdi Baba in a triune as the top had been placed in the portico. 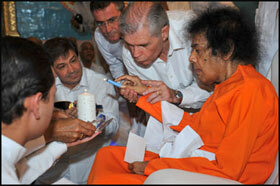 Swami lit the candle and made the customary cut on the cake. 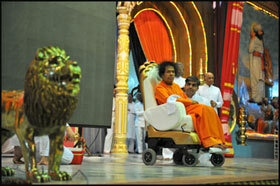 Taking a round in the portico, Swami arrived to the centre of the stage where He sat behind the discourse table. The Veda chanting continued. 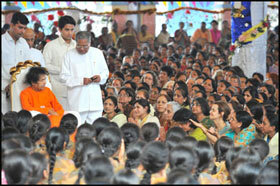 Swami sat listening to the chanting. 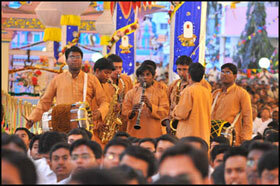 Swami’s welcome into the hall was also marked with the saxophone nadaswaram by the University boys. It was after a long break that everyone was getting this chance of chanting Vedas in His Physical Presence and it was a wonderful feeling. Swami too seemed to be so lost in enjoying the Vedas that He did not ask for the bhajans to begin. 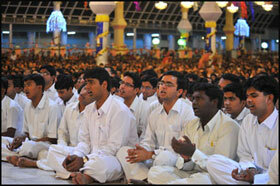 At about 6:40 p.m., the student beside Swami asked whether the Akhanda bhajans could begin. Swami told him to sit and the Veda chanting went on. After a little while and another request later, Swami asked for the bhajans to begin. And thus the alternating bhajans between the ladies and gents began. 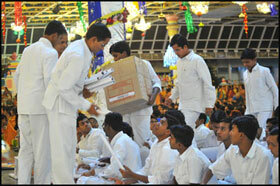 Swami sat for the bhajans till about 7:15 p.m. and then He blessed wall calendars for distribution. He then wanted aarthi to be taken and even indicated for it many times but it was “explained” to Him that Akhanda bhajans would have aarthi the next day! He seemed to accept the explanation! Moving towards the east side of the stage, Swami got into the car and taking another round on the gents’ side, retired for the day. The next day morning, bhajans continued with full intensity. 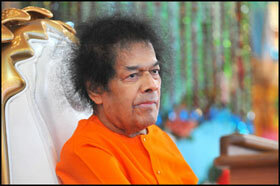 The intensity seemed to slowly fade as the time passed and Swami’s arrival seemed doubtful. 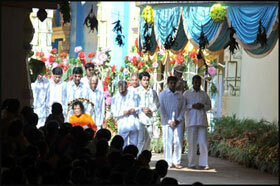 Then, shortly before nine, heads bobbed up and ears perked as the first signals of Swami’s arrival reached the hall. 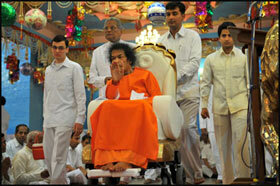 At 9:00 a.m., Swami arrived and it was a joyous Shivarathri surprise for all as He came in the chair! 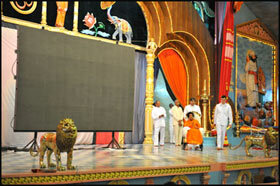 He took a complete darshan round and then moved to the stage. Bhajans continued for another half an hour after which there was the aarthi. Tamarind rice and sweet pongal were then blessed for distribution. 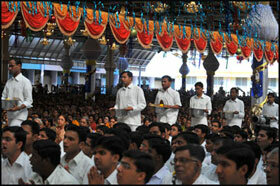 The food prayer was chanted and in the divine presence, everyone had prasadam. 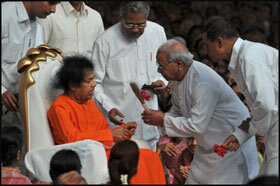 Blessing all, Swami retired by 9:40 a.m.